Lahore (September 14, 2018): The Begum Kalsoom Nawaz, wife of former prime minister Nawaz Sharif, laid to rest next to the resting place of her father-in-law Mian Sharif and brother-in-law Abbas Sharif in Jati Umra. Maulana Tariq Jameel Recite Dua at the end of the burial. Earlier, the funeral prayer of the former first lady has been held at the Sharif Medical City. Renowned Islamic scholar Maulana Tariq Jameel led the prayers. 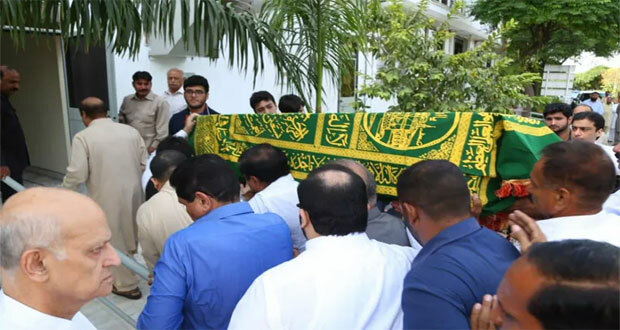 The funeral prayers were attended by Nawaz Sharif, Shehbaz Sharif, Hamza Shehbaz and other Sharif family members excluding Begum Kulsoom’s son Hassan and Hussain Nawaz. The large number of Pakistan Muslim League-Nawaz (PML-N) leaders and workers also attended the funerals. Significant political personalities including Former President Mamnoon Hussain, Prime Minister Azad Kashmir Raja Muhammad Farooq Haider, Pakistan People’s Party leader Khursheed Shah, Qamaz Zaman Kira, former prime minister Raja Pervaiz Ashraf, Farooq Sattar and Khalid Maqbool Siddiqui of MQM-P and Chaudhry brothers participated in the funerals. On the directives of Prime Minister Imran Khan, Speaker National Assembly Asad Qaiser, Governor Punjab Chaudhry Sarwar and other also attended the funeral prayers of the former first lady. Funeral prayers was led by Maulana Tariq Jameel. 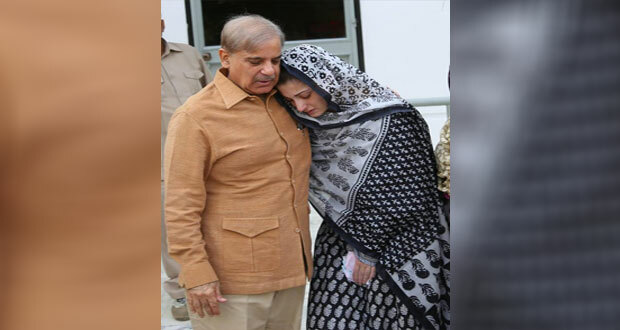 Following the funeral prayers, Kulsoom Nawaz will be laid to rest in Jati Umra next to the resting place of her father-in-law Mian Sharif and brother-in-law Abbas Sharif. Earlier, the arrangements were finalised for funeral prayers. The flight carrying Kulsoom Nawaz’s body arrived at Lahore’s Allama Iqbal International Airport in wee hours on Friday (today), the body was later shifted to Jati Umra, Sharif Family’s ancestral home. As per details, 13 members of Sharif family, including Shehbaz Sharif, Asma Nawaz, sons of Husssain Nawaz and other relatives have come to Pakistan along with the casket via PIA flight PK 758. Kulsoom, 68, wife of former prime minister Nawaz Sharif, breathed her last on Sept 11 at London’s Harley Street Clinic after a long battle with cancer. Former prime minister Nawaz Sharif, who was released on parole from Adiala Jail, is at Sharif Medical City to oversee the arrangements and meeting with the people coming for the condolence. A special security plan has been chalked out ahead of funeral to avert any untoward incident. Nawaz Sharif’s sons Hassan and Hussain Nawaz won’t be attending the last rituals of their mother in Pakistan owing to legal complications. 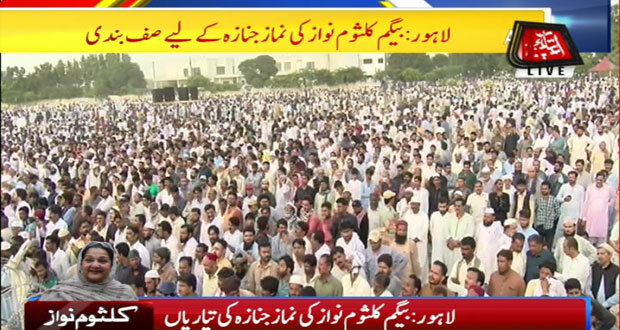 A large number of sympathizers came to condole with the Sharif Family on Friday. Among those who met Nawaz Sharif included Saudi Ambassador to Pakistan, Iranian Consul General, and JUI-F Chief Maulana Fazlur Rehman. Maulana Tariq Jameel arrives at Jati Umra. A delegation of Pakistan Peoples’ Party led by Bilawal Bhutto Zardari is expected to attend the funeral. Governor Punjab Ch Mohammad Sarwar and other party leaders will represent the Pakistan Tehreek-e-Insaf. On Friday, Kulsoom Nawaz’s funeral prayers were offered at the Regents Park Mosque (Islamic Cultural Centre) in London. Hundreds of mourners attended the funeral of the former first lady Kulsoom Nawaz including former Punjab chief minister Shahbaz Sharif, Hasan and Hussain Nawaz, former finance minister Ishaq Dar, former Interior Minister Chaudhary Nisar, former federal minister Berjees Tahir, former AJK prime minister Chaudhary Abdul Majeed, PTI London President Barrister Waheed Miah and representatives of religious and political parties attended the funeral.